Ingesting fats in a moderate way is essential for the correct function of the organism because they are one of the basic macronutrients in the diet and provide us with essential fatty acids that our body can not synthesize by itself, but choosing the best oil is not easy, we have Many options to choose from and there is a lot of debate around the benefits or risks of consuming different types of fats. Oils and fats of animal origin: They are obtained from the adipose deposits of some animals. There are many types of animal oils such as lard and butter. Oils and fats of vegetable origin. They are obtained from fruits and oilseeds by cold pressing the fruit or seed or by means of solvents. They are the most recommended for cooking. Now, before continuing, it is important to recognize that oils have a molecular structure that is affected by temperature. This means that when we heat the oil to cook the molecular structure changes, it is subjected to oxidation and from this, that an oil is or not the best for cooking does not mean that it is bad and depending on the types of fats it contains it can be ideal for cooking or to enjoy it raw. 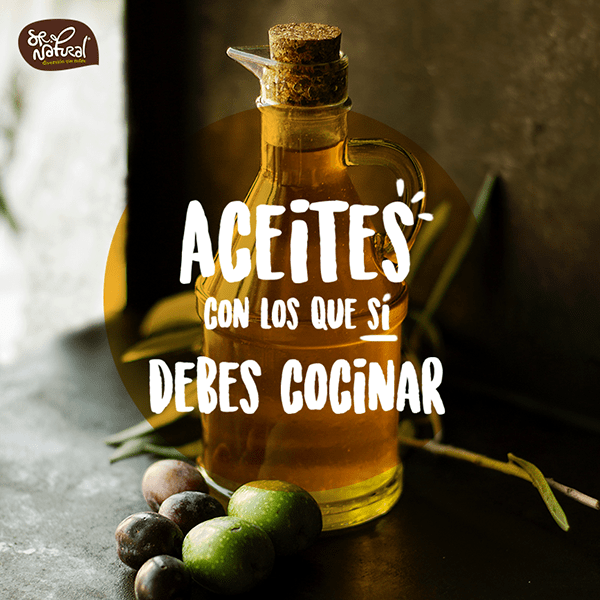 Aceite de oliva: high contribution of vitamin E. It has an extraordinary smell and flavor that make it suitable for use in crude. Its recommended maximum temperature is 190ºC. Sunflower oil: light and tasteless. It has a great resistance to heat. Its recommended maximum temperature is 246ºC. Corn oil: It also has a great resistance to heat. It is used a lot for baking and frying. Its recommended maximum temperature is 236ºC. Soy oil: widely used in the Latin culinary culture, it is also rich in vitamin E and also in healthy omega 3 fats. Its recommended maximum temperature is 241ºC. When considering oils with monounsaturated and polyunsaturated fats, they help improve the health of our heart and arteries, because they reduce the "bad cholesterol" (LDL) in the blood and increase the "good cholesterol" (HDL), preventing some heart diseases. Among other properties, it is found to lower blood pressure and refroze the defenses of the immune system against diseases. Care should be taken during cooking to prevent the oil from producing smoke. If they exceed the maximum temperature, they lose their nutritional properties. The most recommended methods of cooking are baked, sautéed, in pressure cookers, in salads or sauces. Try frying less, do not reuse or mix the oils and generally minimize the amount of cooking oil. Last but not least, If you also aim to control your weight, the aerosol oil is a very useful product for cooking, it has the advantage that it does not provide calories or alter the taste of food.